Krista is a Wyoming native, who received her undergraduate degree and attended law school at the University of Wyoming. Krista gained experience in family law and estate planning in law school when she worked with the student clinics for Domestic Violence and Estate Planning for low-income clients. There she developed a passion for helping individuals and families in those areas. After law school, Krista and her husband moved to Denver. They fell in love with Colorado and hope to never leave. 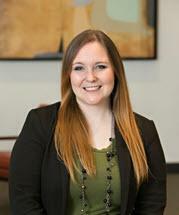 Krista previously worked with two other firms before joining the Law Office of Alexandra White. She brings with her considerable experience in family law, civil litigation, bankruptcy and estate planning. Krista focuses on helping her clients settle their cases, and keeping important decisions about their lives and families out of the hands of the Court. As the head of the estate planning department, she is also very passionate about providing affordable estate planning services. She believes it is vital for everyone to have some sort of estate planning in place. In her free time, Krista enjoys watching movies and spending time outdoors with her husband and son.